The beautiful Gabrielle Union is one of the most renowned actresses in the United States. She has given many hit movies to Hollywood including The Brothers, Deliver Us from Eva, Daddy's Little Girls, Think Like a Man and Think Like a Man Too. Don't forget to watch her upcoming movie Sleepless !! Gabrielle Union is a married woman and for the past few months, she is rumored to be expecting her first child together with her husband Dwyane Wade who is a professional American basketball player. But recently, the 44-year-old actress addressed her pregnancy rumor with a number of amusing tweets before heading to the Ocean Drive Magazine party. Let's learn more about this story. Just stay with us. The gorgeous and dynamic personality, Gabrielle Union was surrounded by her pregnancy rumor for a few months in the past and recently she shut down the rumors with a series of tweets which clearly says that Gabrielle is not expecting a baby. Here're those tweets, check them out. I also have never responded to the COUNTLESS fake pregnancies I've been given over the years but I just SO love writing "uterus" UTERUS JOY! Just becuz you say it and say it and say it and say it...doesn't make it true or real. Enjoy the weekend folks, I'll be at the bar ?????????????????? All these tweets were shared before Gabrielle went to the Ocean Drive Magazine party at the Nautilus, a SIXTY Hotel, in Miami Beach. She attended the party alongside her husband Dwyane Wade to appear on the cover of the May/June edition. The Bring It On star was in a cream top exposing her midriff and an elegant pair of matching trousers with thigh splits exposing her toned legs. Meanwhile, her basketballer husband Dwayne Wade was smart in a navy suit, buttoned up white shirt and a pair of white Vans shoes. Dwyane finished off the ensemble with a light gray fedora hat. The happily married couple appeared in high spirits and skimmed the magazine together while posing for photos at the exclusive party. After years of dating, the celebrity couple who first met in a pretty conventional way in 2007: while co-hosting a Super Bowl party, got married on 30 August 2014. Last year, Gabrielle opened up about her decision to get married to Dwyane in 2014 and explained to the Ocean Drive that she wanted to secure a family unit for the sake of her children. 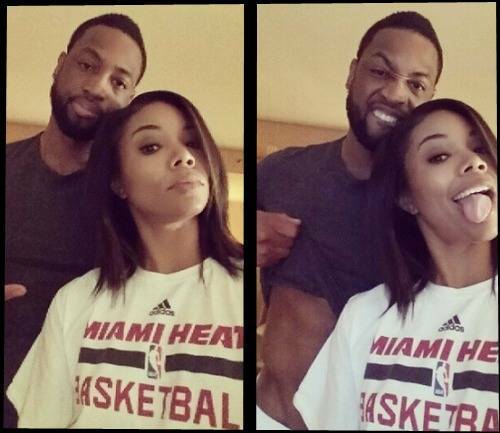 [Dwyane] and I could have gone on for a long time as boyfriend and girlfriend, but the kids were the driving force in wanting us to be a legitimate, like, 'real' - and I'm using my finger quotes - family in their eyes. We got on board with it, and it's the best decision we could have made - not just for us as a couple, but for our family. If you have good, effective, honest communication, you can handle any issue or problem in a relationship. D is literally my best friend. Gabrielle has no children of her own but we would like to inform you that she is the step-mother of Dwyane's two children and both are sons namely Zion and Zaire from his previous marriage to Siohvaughn Funches. The basketball player also has another son Xavier, who was born to his ex-girlfriend Aja Metoyer. We wish the Wade family all the very best for their tomorrow. For more updates, stay connected with Frostsnow.